Stayton, OR., January 28, 2019 – Slayden Constructors, Inc. (Slayden), a division of MWH Constructors, Inc. (MWHC), has been selected by the City of Salem, Ore., to provide turnkey construction services for the $13 million Willow Lake Cogeneration Facility Upgrade project. Construction on the project is slated to begin in February 2019 with completion by mid-summer 2020. The current cogeneration system generates up to 650 kilowatts (kW) of electricity and can no longer process the amount of biogas being produced. The upgraded cogeneration system will more efficiently and reliably generate up to 1,200 kW of electricity, nearly 50 percent of the total electricity needed to operate the Willow Lake Wastewater Treatment Plant for a year, or enough energy to power 900 homes. The treatment plan provides wastewater services to residents in the cities of Salem, Turner and Keizer. As the prime contractor, Slayden will provide the entire project scope and will be self-performing demo, civil, concrete, mechanical and piping. 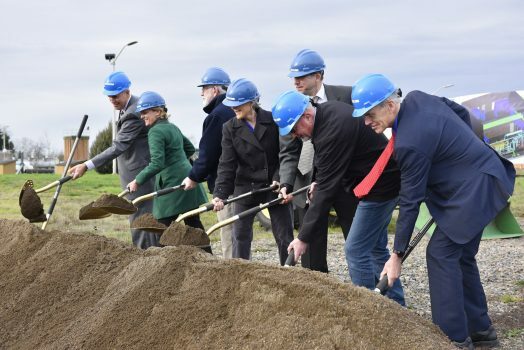 The groundbreaking for the project took place earlier this month and was hosted by Salem, Keizer, and their funding partners, Portland General Electric (PGE) and the Energy Trust of Oregon. The ceremony was attended by Salem Mayor Chuck Bennett, Keizer Mayor Cathy Clark, Peter West, director of Energy Programs at Energy Trust, and Bill Nicolson, senior vice president of Transmission and Distribution for PGE.